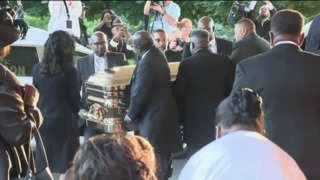 Aretha Franklin’s casket arrived on August 31, 2018 at Detroit’s Greater Grace Temple for her funeral. Guests in attendance included Smokey Robinson, Bill Clinton, Ariana Grande, Faith Hill, Jennifer Hudson, the Rev. Al Sharpton and Jesse Jackson.